Yep. We know it all, that time of the year when the seasons change.. When the sun is out, it still gets really warm, your wear too many clothes, start sweating, the sun goes down it gets cold and as you’re sweaty you get cold. Or, scenario 2: it’s a warm sunny day and you get totally excited and wear too little. Sun goes down, you’re really getting cold and keep freezing your, excuse my French, bum off. At the bottom line both situation have the same effect: welcome to the season where each and everyone around you and at some stage even the healthy YOU gets sick!!! 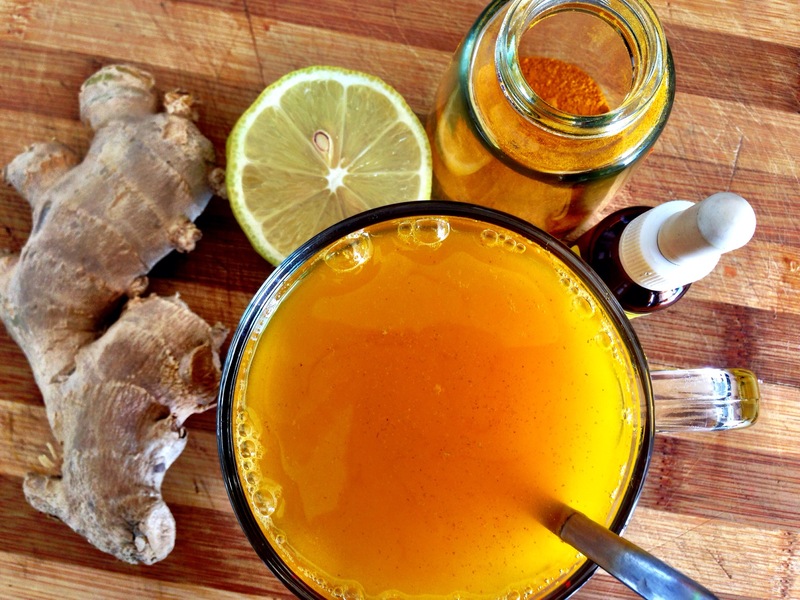 The super ingredient in this drink is tumeric, also known as curcuma. The health benefits of tumeric are countless (click here for the top 10), but next to many others it’s super inflammatory and antibacterial and this is exactly what we want, oh yes! So save the heavy stuff from the pharmacy for emergencies and give this drink a try! First boil the water. Let it stand for a bit so it’s not boiling hot anymore (the raw honey wouldn’t like that). Prepare your favorite mug with the tumeric, honey, ginger slices, lemon juice and the tiniest pinch of cayenne if you decided to go for it. Now add only a bit of the hot water and stir properly. If you stir it later it will be more difficult to mix the tumeric powder easily. When it’s all well blended top up with the remaining hot water, give it another stir and drink in small sips as long as it’s warm. If you like it sweeter add a bit more honey and enjoy!